An energizing tonic that fights fatigue and helps increase resistance to stress. Fast and sustained action. Note: Ideal for active people who must perform at work from early morning and still have energy for family time or the gym, come evening. Perfect for individuals who have to perform mentally or physically under stress. 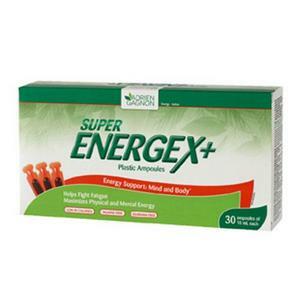 The Super Energex formula is designed to provide both a fast-acting energizing action to help start off your day and to produce a long-lasting revitalizing action to help fight fatigue and stress all day long.